The NOJA fireplace set exhibits modern design and it is as stylish as it is practical. The NOJA fireplace set exhibits modern design and it is as stylish as it is practical. The fireplace set fits well into modern and traditional environments, and it consists of an elegant bracket, a light ash shovel and a remodeled coal rake. The bracket of the NOJA fireplace set is robust and stands firmly. 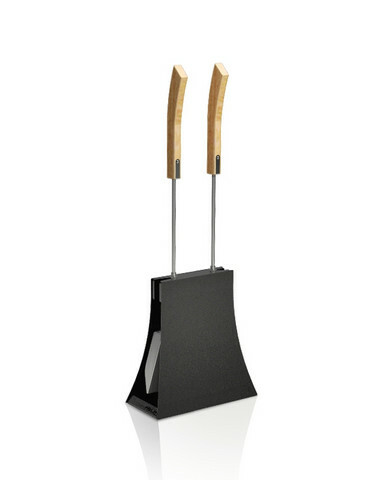 The unique locking mechanism makes it easy to release the shovel and rake from the bracket. When put in the bracket, they are latched securely; hence the whole set is easy and light to move around with just one hand. The set is manufactured of high-quality materials – the bracket and coal rake are made of tough steel, and the ash shovel of light marine aluminum. The handles are made of oak or stained birch and all the parts are designed to last. They show no sign of corrosion even after years of use. Colours: glossy white (Pure White) and metallic black (Rock Black). The fireplace set is available in glossy white (Pure White) and metallic black (Rock Black).